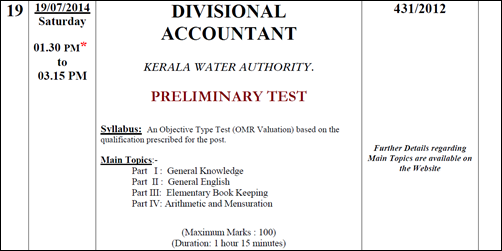 The Kerala PSC has taken all steps to conduct the divisional accountant in water authority exam 2014. As per the schedule, the exam will be held on 19th July 2014 Saturday from 1.30 PM to 3.15 PM. Candidates can download the admission tickets through their one time registration profile in the Kerala PSC website www.keralapsc.gov.in from 28th May 2014. The preliminarily test consists of an objective type exam (OMR Valuation) based on the qualification prescribed for the post. The exam duration will be 1 hour 15 minutes with maximum marks 100. Divided into 4 parts, the main topics for the exam are General Knowledge, General English, Elementary Book Keeping and Arithmetic and Mensuration. According to the information provided in the notification, a detailed exam is to be conducted. A minimum of 60 marks is required for the first two papers with 40%, while a minimum of 100 marks with 50% is needed for the 3rd paper. A separate minimum of 30% for paper I and II and 35% for paper III is approved in the case of candidates belonging to Scheduled Caste/Scheduled Tribe. The duration of each of the 3 paper will be 3 hours. The General Knowledge paper is proposed to test the ability of the candidate to write in clear and simple English. Question on General Knowledge, Precis of a given passage and General English will be asked for the exam. "Students complete commercial Book keeping, Accountancy and Banking" by Arthur field House is prescribed as the test book for the Elementary Book-Keeping paper. Knowledge of the chapters in "Advance Accounts" by R.N. Carter is a must. For Arithmetic and Mensuration, "Mensuration for Indian Schools and Colleges" Part I by pier point is prescribed as the text book. The qualifying test is also called "The initial Recruitment Examination for Divisional Accountants". With a scale of pay ranging from 19440 – 34430, the number of vacancies is fixed at 16. As with 2,89,669 applicants attending the exam, the list of selected candidates will be published by the Commission.